Below is a list of the top downloaded items from the PlayStation Store for the week ending October 22nd. 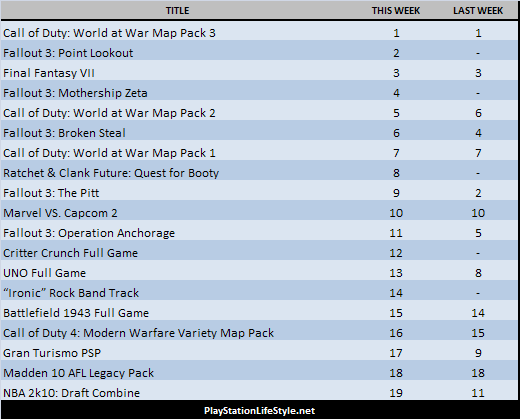 This week Call of Duty: World at War and Fallout 3 both dominate the chart. The number one spot is occupied by the latest COD: WAW Map Pack for the second straight week. Fallout 3’s add on content has been very popular over the past few weeks. Check back each week for the lastest and most popular downloads from the PlayStation Store.